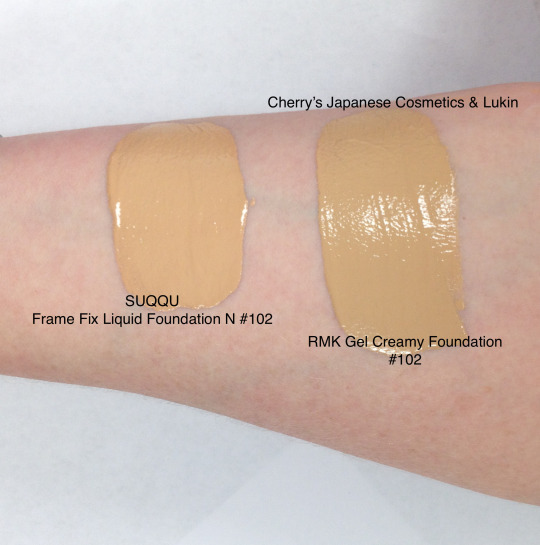 We also send Lukin samples of RMK Gel Creamy Foundation #102 and SUQQU Frame Fix Liquid Foundation N #102. Here what Lukin, the American girl is saying. 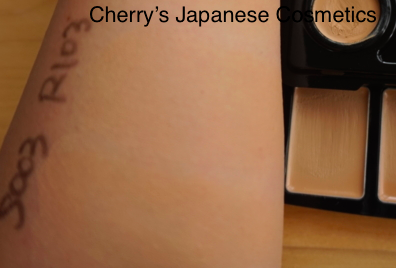 SUQQU – I think the “Frame Fix” is a good name because this foundation was rich and had good viscosity. 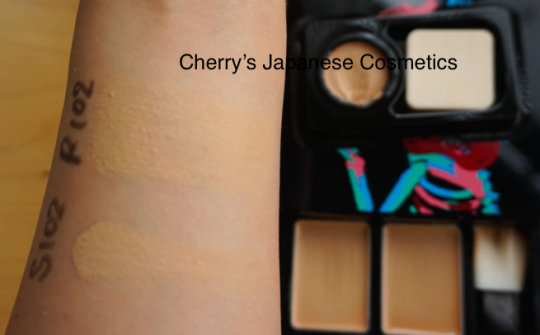 It would be good for someone who wanted or needed to take her time for perfect coverage or for someone new to foundation. RMK – gel & creamy are two good words to describe the foundation. I like that the gel products feel cool when you apply them. It’s a fresh feeling. Hmm, there are no samples/ full bottles of RMK Gel Creamy Foundation and SUQQU Frame Fix Liquid Foundation N and I can not show you the finish with comparing. Hope those will help you to see. 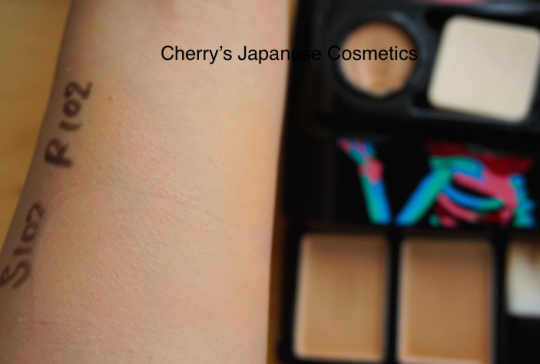 I(Cherry) was just curious about the shade of RMK and SUQQU. They are from the same company. Let me show you the shade swatch. The foundations are RMK Casual Solid Foundation #102 & #103, and SUQQU Frame Fix Moist Pact Foundation N #102 & Lasting Pact Foundation N #103. 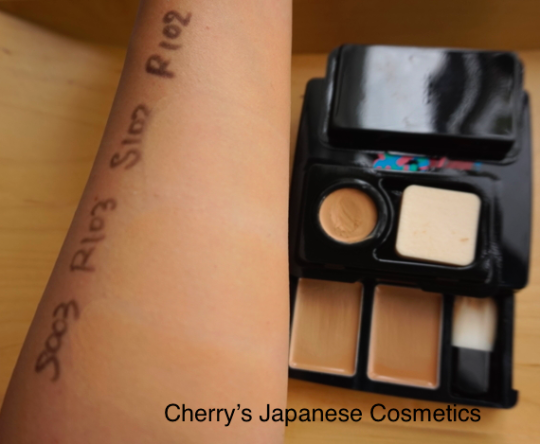 Both RMK Casual Sold Foundation and SUQQU Moist Pact Foundation are categorized as emulsion. OH!! Can you see the difference? I did not find the difference of the shade difference. But the finish is different. 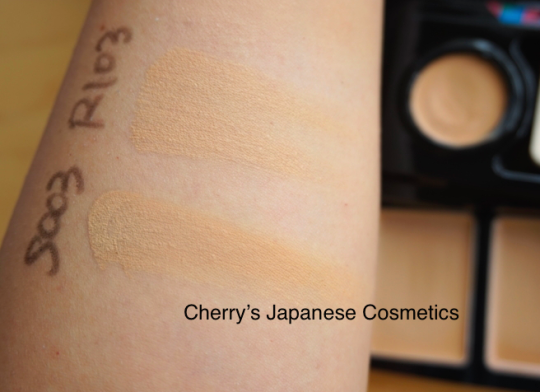 RMK Casual Solid Foundation is glow, and SUQQU Moist Pact is natural to matte. RMK is not shining as radiant. Both are middle coverage in my eyes. OOPS, the photo quality is not good. In my eyes, RMK #103 is the same with SUQQU #003. But the finish is different. RMK is glow, and SUQQU is natural to matte. In my eyes, it is significantly different between an group of RMK & SUQQU #102, and RMK #103 & SUQQU #003. If you wanna order them, visit those.